Shedding for the Wedding? Shed the Lies Instead! Every bride is reminded her wedding day is all about her. But instead of focusing on the happy relationship, major industries keep women focused on one new aspect of being a bride: becoming as small as possible for the big day. I, Lexie, got married while I was a PhD candidate knee-deep in studying all these unreal beauty ideals women are up against. Because of this, I chose to do my “big day” Beauty Redefined style to maximize my happiness and minimize my body angst. So, from a personal perspective and a research-driven lens, let’s talk about what the now-commonplace pressures of “shedding for the wedding” mean for women everywhere. 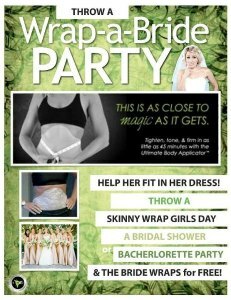 Before the year 2000, there were very few pushes to get women to lose weight before their weddings. Advertisers and industry execs hadn’t conceived of this new “flaw” yet. In fact, Cornell researchers found only one weight loss ad in all the 1990s wedding magazines they could get their hands on! Photoshopping didn’t become an industry standard until the late 90s, so women featured in magazines and ads weren’t being digitally manipulated out of reality quite yet. AND plastic surgery didn’t shoot through the roof until the 21st century, when rates of cosmetic surgeries performed in the U.S. increased 446 percent to reach $12 billion in 2010, with 92 percent performed on women. Simultaneously, the weight loss industry is flourishing unlike ever before, with $61 billion spent pushing the quest for thinness at all costs in 2010 – more than twice as much as in 1992. So it isn’t surprising that a full 70 percent of nearly 300 engaged women said they wanted to lose weight – usually 20 pounds – a 2007 Cornell study found. * Where on earth would they get that idea? Since 2000, industries revolving around diet and weight loss, plastic surgery, weddings, and women’s media have placed a target on brides-to-be. In the last decade, we have seen the rise of popular TV shows, advertising campaigns, surgical procedures, magic wraps to lose inches in minutes, and diet plans/pills that demand an unattainable “bridal beauty” that is harmful to health, happiness, relationships, and female progress in every way that really matters. These days, master cleanses (pedaled by the likes of Demi Moore and Gwyneth Paltrow in order to fit into their red carpet dresses or go naked on set) are popular among engaged women. “Bridalplasty,” “Shedding for the Wedding,” “Bridal Bootcamp,” (and other hopefully canceled shows) teach women that in order to show your face on your big day, you must fight against other women on your quest for necessary cosmetic procedures, extreme weight loss, and endure public shaming. In the last decade, researchers have seen a major escalation in anorexic behavior among brides-to-be, and have labeled it “brideorexia.” Plus, 10 percent of women who start extreme pre-wedding diet and exercise programs will develop a lasting disorder, according to Dr. Ira M. Sacker, eating disorder specialist and professor at NYU Medical Center. When I got engaged, I knew what I was up against. 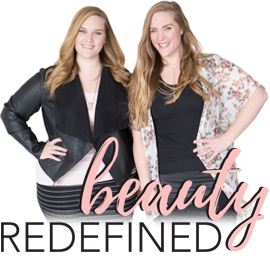 I talked to Lindsay about my goals for making my engagement and wedding as “Beauty Redefined” as possible. I wanted to be happy, I didn’t want to buy into all the lies these industries were demanding I fall for, and I wanted to keep the focus on celebrating my relationship with the awesome man I found that loved me – not just a vision of me, but ALL of me. And so I made a plan of attack to do my own version of “shedding for the wedding” – NOT shedding weight, but shedding all those lies I’d heard from the time I was a teenager in the late 90s about what I had to look like to be happy on my wedding day. I truly grew up believing I had to look a very particular way in order to be happy, to be successful, to be loved, to qualify to be married at all. But something very powerful has been confirmed to me in the last year. All those messages I grew up surrounded by are LIES. And while I hoped they were lies, I can now prove it. Because I do not fit the ideals media tells me I’m supposed to fit to be happy, successful, loved, and married. And guess what? I’m happy! And I’m (trying my hardest to be) successful! And I’m loved! And I’m MARRIED! It’s crazy, and it’s true. And whether you are married or single, planning a wedding or not, these strategies apply to all of us. They worked for me, they work in scholarly research, and they will help you understand your worth in a world that so often confuses you about who you are just to make a few dollars. 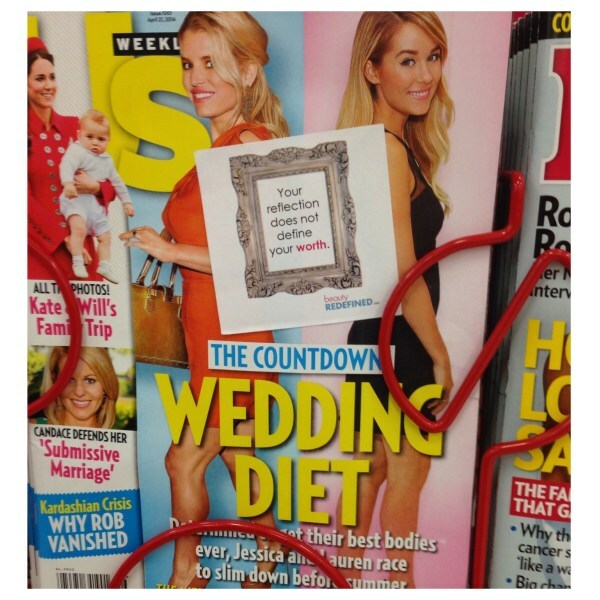 Click the image to check out our sticky notes that are PERFECT for providing unexpected reminders for publicly displayed body-shaming magazines! Resist Pinterest and back away from those bridal magazines: Choose a time period to steer clear of as much media as you can. That way, you can see how your life is different without all those messages and images, and when you return to media, you will be more sensitive to the messages that hurt you and those that are unrealistic. I chose to never pick up a bridal magazine, read a bridal blog, go to Pinterest wedding pages, etc. This made it much easier for me to not hold myself or my wedding to the standard of others, but plan it the way I wanted it. I was able to steer clear of all Photoshopped wedding dress models and idealized images of “bridal beauty.” I believe this was the most important goal I accomplished. I ordered two dresses online – one from a vintage boutique and one new dress I’m wearing in my pictures that was sure to fit me. Both were fantastic, and I got to steer clear of bridal salons completely! Forget your arbitrary wedding weight or size goals: Make a goal to stop or limit the number of times you weigh or measure yourself. When we fixate on arbitrary numbers, that often gets in the way of our health. Start judging your health through your activity level by setting a fitness goal instead of a meaningless number, and you’ll get somewhere great! I did not weigh or measure myself throughout my engagement and set a goal to maintain my fitness routine at the gym as I had been doing previously, but not work to lose any weight to change my appearance for the wedding. My fiancé fell in love with me the way I am, and I didn’t want to buy into the lies that told me I had to “vow to wow” on my wedding day by losing weight. Stop that negative mental script: Too many girls and women have a constant script of mean thoughts about themselves running through their minds — whether they’re comparing themselves to Photoshopped brides on Pinterest or not. Recent studies show us that girls who don’t like their bodies become more sedentary over time and pay less attention to having a healthy diet. If you think you’re gross and worthless, why would you take care of yourself? Set a goal to stop saying negative things about yourself. Start with your thoughts — acknowledging when the negative ones creep in and consciously replacing them with self-affirmations (go big on the cheesiness here). Choose a day, a week, a month, whatever you can do to start it, and make it a permanent practice! While I had previously been working on this goal, I decided to take it up a notch and cut out all negative talk entirely – even when trying on wedding dresses or viewing my engagement or wedding photos. Think nice thoughts instead: On the flipside of the last study, research has found that girls who respect their bodies are more likely to be physically active and eat healthy. They make healthy lifestyle choices way, way into the future. ** Since what we THINK about our bodies has a strong connection to how we TREAT our bodies, set a goal to shut out negative thoughts as they come and replace them with positive truths! I replaced any negative thoughts that crept into my mind with something positive about my abilities and found major improvements in the negative script that would run through my mind when I was feeling self-conscious. 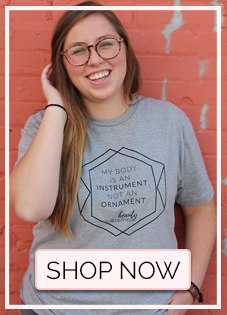 Put your wedding budget where your mouth is: Make a goal to only shop at stores that treat females respectfully in their advertising and products. Speaking up with your pocketbook is one of the most powerful ways you can show retailers what you will and will not put up with. For my bridal showers and bachelorette party, I made sure my friends knew I didn’t want to support Victoria’s Secret because I didn’t approve of their marketing. Everyone respected my wishes and VS was not among my gifts! I didn’t feel like I compromised my beliefs for my wedding and my friends got to hear why I am a hater of VS and all other marketing like it. You will be hounded by weight loss and “bridal beauty” advertising online the second the internet finds out about your engagement. Targeted ads on everything from Facebook to Gmail will blast you with reasons to feel shame and want to hide/fix parts of yourself for your “big day.” Don’t even think about clicking on those anxiety-inducing ads. They make money the second you even click. Do it for YOU and your pocketbook! 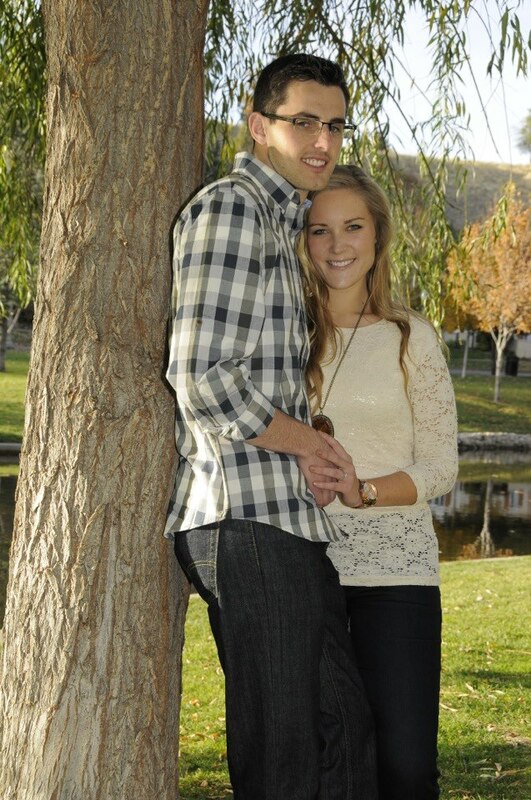 Lexie and her husband — un-Photoshopped of course! Don’t Let Your Photos be Photoshopped out of Reality: If you hire a wedding photographer for anything from your engagement pics to your bridal and wedding shots, speak with that person about your goals to be all of YOU, which includes looking like you in your pictures. In a media world where Photoshopping is an industry standard, it might be tempting to just stay quiet and let that photographer make you look your “personal best” (gag). But imagine the influence you can have on all those loved ones who will see your photos. What if you let them see reality, instead of some hollow, blurred shell of you? What if you let them see those crinkles by your eyes from smiling so much? Or your freckles, stray hairs, the actual curves of your body (or lack of curves! ), etc. Plus, you will likely always compare yourself to your wedding pictures. Give yourself a realistic image so you aren’t constantly coming up short. Take hold of your beautiful reality and OWN IT. I grew up believing I probably wouldn’t find love because I didn’t look like someone that was capable of being loved, and I debunked that major myth. When you look at reality, everyone debunks these myths in so many ways. Those lies that yelled that I must VOW TO WOW on my big day – are such major lies. I didn’t change my appearance in any way – I refused to go tanning, I didn’t highlight my hair, I wore my usual amount of minimal makeup that I did myself, I didn’t lose any weight – all to prove a point. And my point was proved. My husband fell in love with ME – not a vision of me, but all of me. And my “big day” was a celebration of love that wasn’t even about ME; it was about us and our families. I woudn’t have done it any other way. I am SO glad my husband loves me the way I am, but I have had to fight to love myself first. It isn’t anyone else’s job to convince you you are beautiful. A significant other can do a world of good to improve your health and body image, but they can’t do it all for you. You get to be the hero in your own body positivity fairy tale, but having a loving supporter (or several) is key. *Neighbors, L., & Sobal, J. (2007). Prevalence and magnitude of body weight and shape dissatisfaction among university students. Eating Behaviors, 9(4), 429-39. **van den Berg, P., & Neumark-Sztainer, D. (2007). Fat ‘n happy 5 years later: Is it bad for overweight girls to like their bodies? Journal of Adolescent Health, 41, 415-417.